Today’s post is from Luann Alemao, a chef and health/wellness speaker we’ve worked with over the years. Luann hosts a TV show titled Get Fit, operates several Kids Culinary Camps and offers presentations to corporations on healthy eating. Here, Luann offers a quick tutorial on making your own simple oil and vinegar dressings. Oil and vinegar don’t mix. I had heard that phrase while growing up, but as I attended food and nutrition courses and did my own experimentation in the kitchen, I recognized they are compatible on the salad plate. When making basic vinaigrette keep in mind that it’s 3 parts oil to 1 part vinegar. From that point, the type of oil, the kind of vinegar and the choice of seasonings or add-ins are up to you. EVOO, Virgin, Pure or Seasoned– these are referring most of the time to olive oils in recipes. Other oils, such as soy, almond, and avocado will make great vinaigrettes too and will offer a distinction of their own originality in your vinaigrette. You can make fine vinaigrette in just a pint jar or a salad cruet; you just need a vessel to shake up the ingredients and create an emulsifier for a short duration anyway. 1) Olive oil is the typical choice of taste and rightly so, as it has a fresh taste and natural fruitiness. My second favorite is soy oil as it is clean and light and doesn’t add an oily taste to vinaigrettes. Light and extra light refer to the color of the oil and not the caloric content – don’t be misled. Fats do have calories and so does olive oil at 120 calories per tablespoon. Experiment with different regional oils and you will notice the differences. 2) Next is the acid or the vinegar. Balsamic vinegar is my favorite, with its sweeter aroma and sweeter taste. It is rich in color, has undergone a special aging process and may be cured 12-25 years. Vinegar, because of its strong acidic makeup, does not require refrigeration. 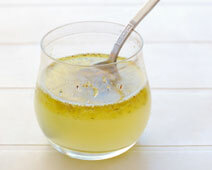 Other vinegars such as flavored vinegars, apple cider or rice wine vinegar are great culinary choices as well. White distilled is too harsh and best used for cleaning purposes afterward. 3) The add-ins: The combinations you can create are endless. Some dried mustard or Dijon adds a savory flavor. Don’t forget the garlic and seasonings. Beyond the salt and pepper you can flavor with basil, Italian herbs, ginger, cilantro or tarragon. Use the zest from limes, oranges and lemons. They add a citrusy blend that is clean and fresh. Don’t have vinegar? A lemon will work just as well. I personally use a lemon along with the balsamic vinegar as I like the aroma and the pungent taste it offers. Make sure you use some of the zest (the outside peel) for more flavor and aroma. Making your own salad dressing is cheaper too. It costs just pennies per tablespoon and to buy will be 4-5 times more. Save and FLAV! What more could you want? Shake in a tight container and serve over greens. Shake in a tight container, let sit for about a ½ hour for flavors to macerate and pour over dark greens. How do you use oils to make dressings? This entry was posted in In the kitchen, Natural health and tagged chef, food, Frontier, lemon, Luann Alameo, nutrition, oil, olive oil, organics, recipes, salad dressing, spices, vinaigrette by Cayenne Room. Bookmark the permalink.